Every year, about three million Americans go scuba diving. While there are plenty of places across the country to dive, Destin is undoubtedly a top pick. Whether you're a complete novice or a seasoned pro, let this be your ultimate guide to diving in Destin. There are plenty of excellent spots to dive in Destin. Many visitors make the mistake of thinking that the only diving spots are located in the Gulf of Mexico. While the gulf is certainly home to some great diving destinations, you can find plenty to see underwater a lot closer to the shore. The inlet to Destin is dredged, which means that the jetties are a fantastic spot to admire underwater life. At the eastern side of the Destin jetties, divers can observe an abundance of sea life on a relatively shallow dive. That, combined with visibility extending for as much as 50 feet during certain tides, makes it an obvious choice for diving. In addition, Destin is home to dozens of shipwrecks. 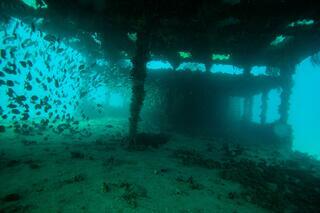 These have created incredible artificial reefs that make for great scuba diving locations. Before diving in Destin or anywhere else for that matter, prospective divers should be certified by the Professional Association of Diving Instructors, or PADI for short. PADI offers regular courses to ensure all those who dive are prepared to do so safely. If you're not yet certified, you can usually find a local course close to home in preparation for your trip. Alternatively, you can join a PADI certification course right in Destin. There's no doubt about it: Diving in Destin is a blast! However, not everyone is up for scuba diving. Thankfully, there are plenty of alternatives that offer some of the same benefits and excitement. With the pontoon boat rentals Destin has to offer, you can rent a boat and then try out a range of water-based activities suitable for the whole family. One choice that is growing in popularity is SNUBA®. This is very similar to scuba diving in that it has a regulator, and it allows for deeper dives. Instead of wearing a tank of air on your back, however, the tank floats at the surface and connects the mouthpiece via a long tube. It is often cited as a safer and less physically demanding alternative to scuba diving. Here's a video of a group enjoying SNUBA® in Destin. An even easier choice, and a perfect alternative for children and those who aren't PADI certified, is snorkeling. The equipment is readily available and inexpensive, and it allows participants to enjoy the beauty of the sea without significant safety risks. Plenty of visitors heading to Destin arrive by car and bring their diving gear with them. However, there are also lots of options to buy or rent diving gear upon arrival in Destin. The greatest concentration of stores offering diving equipment is located on either side of Harbor Boulevard. If you're renting equipment you're unfamiliar with, make sure you test it out in a controlled environment first. A Destin swimming pool or a shallow spot in the harbor are two great options. Double Fun Watersports should be your first stop when planning to do an inshore dive in Destin. With a double-decker pontoon boat rental, you can partake in one of the top Destin pastimes, and you can do it all on your own schedule. Book your pontoon boat today!